This year Shinkosai is held on September 15, Saturday, Hoshukusai on 16, Sunday and Kankosai on 17, Monday. The festival is formally called Hitachinokuni Sojagu Reitaisai (Hitachinokuni Grand Shrine’s Annual Festival), and the most important ceremonies at the shrine. It is said that people from Ishioka will return to their hometown at this festival even though they will not return at obon or the New Year holidays. So, this is a very important event for the citizens in Ishioka. Also, it is considered one of the three great festivals in the Kanto region, and the gorgeous portable shrine with a prestigious 16-pedal-chrysanthemum crest, of which possession is limited, the same as that of the imperial family, will be seen. 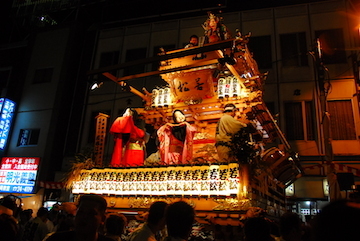 In addition nearly 40 cars of great festive floats and horojishi (or a lion head with a large cloth) are moving on. Every year nearly 400,000 people enjoy the festival for three days in total. 2018년 이시오카 축제(신행제, 봉축제, 환행제)는 9월 15일 (토), 16일 (일), 17일 (월)에 거행 됩니다. 「이시오카 축제」는 정식으로는 「히타치노구니소샤구레이타이사이」라고 하며 창건 천년을 자랑하는 고사, 히타치노구니소샤구의 가장 중요한 축제 입니다. 「설날이나 오봉에는 귀성하지 않아도 축제에는 돌아온다 」라고 할 정도로 이시오카 출신에게 있어서는 뜻깊은 축제로 이시오카 시민들이 1년중 가장 열정적으로 뜨거워지는 날입니다. 「관동 3대 축제」의 하나로 일컬어지며 일본 황실과 같이 「국화 문장」(정식으로 16변)을 허락한 격식있는 가마(神輿)를 비롯해 호화찬란한 축제수레(山車)나 웅장한 호로지시(幌獅子)등 40대 이상이 시내를 순행합니다. 축제 기간중 3일간으로 약 40만인을 넘는 구경꾼이 방문을 합니다. Annually on September 15 most of the shrine parishioners including the chairperson, shrine representatives, and important guests get together and participate in the ceremony. 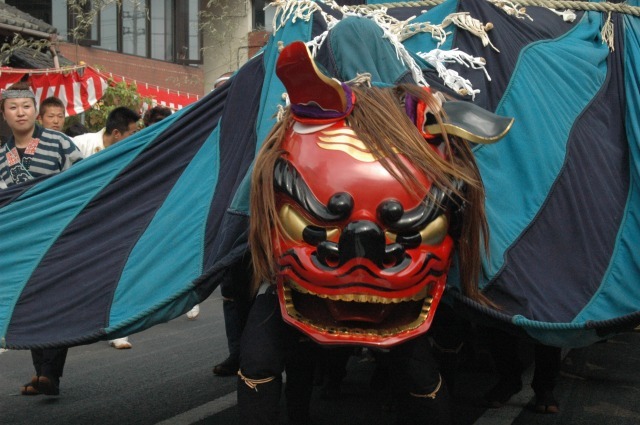 Performances such as lion dance and sasara (three-black-lion-dance) are offered to the deity, but no sightseeing events take place. 매년 9월15일(고정)에 쇼사구(総社宮)의 배전(拝殿)에서 씨족신 후손(氏子)이하, 신사 총대나 씨족신 후손 마을내의 대표자, 각지에서 온 내빈이 참례하고 기원을 합니다. 흑사자 3마리의 춤(獅子舞やささら)으로 봉납을 합니다. This event has a meaning that part of the deity at Hitachinokuni Grand Shrine will go down to a tentative shrine called okariya at the town on duty. 히타치노구니소샤구의 분영(분신)이 연방정의 임시 봉안전에 진좌하는 행사 입니다. At 2 pm a starting signal fireworks take place. 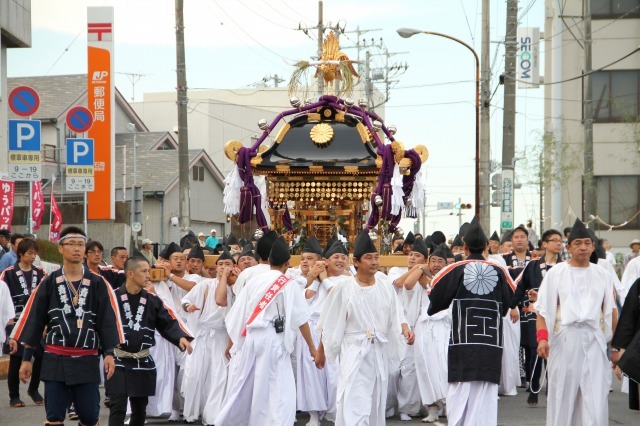 A large portable shrine, lion heads with cloth and festive floats begin to head for Okariya (the tentative shrine). 오후2시, 불꽃놀이를 신호로 무게 1톤이나 되는 큰 가마는 호로지시나 축제수레등과 함께 그해의 연방정 에 설치된 임시 봉안전으로 향합니다. โฮชุคุไซ (เทศกาลแห่งการเฉลิมฉลอง) วันที่ 16 ก.ย. In the precinct of Hitachinokuni Grand Shrine, a sumo performance is offered to the deity in the morning. In the afternoon, at Kaguraden mikomai (or shrine maiden dance) and Someya’s performance of sacred Shinto music and dancing and the likes are offered. At 3 pm lion heads with cloth get together and walk in a parade on the streets in front of the station. At 6:45 pm festive floats begin to walk in a parade on the streets in front of the station. Around 8:30 pm at the okariya some Shinto ceremonies and shrine maiden dance will be seen and red and white rice cakes will be thrown to the visitors. 히타치노구니소샤구 경내에서 오전중, 봉납스모가 열려 오후 신락전에서 무녀춤이나 12곡의 신악(神楽)이 봉납이 되어집니다. 오후 6시 45분 부터 같은 역전거리에서 축제수레 퍼레이드가 개최된다. 오후 8시 반경 임시봉안전제. 신사, 무녀춤, 홍백떡을 던집니다. คันโคไซ (เทศกาลแห่งการหวนคืน) วันที่ 17 ก.ย. This is a ceremony where the part of deity being staying at the tentative shrine will return to the home shrine. At 2 pm a starting signal fireworks take place. The large portable shrine leave the tentative shrine with lion heads with cloth and festive floats. Seeing them walk in a parade on the streets is a lot of fun. At 4 pm the portable shrine get to home shrine, and duties for the next year festival are handed over. 임시 봉안전에 진좌되어 있던 분영이 다시 본전으로 돌아가는 행사 입니다. 오후 2시 불꽃놀이를 신호로 연방정의 임시봉안전에서 가마가 출발해 신행제와 역코스로 화려한 행렬없이 호로지시나 축제수레가 본전을 향합니다. 오후 4시 가마가 히타치노쿠니쇼샤구에 돌아오면 신사, 연방정의 인계가 이루어집니다.